This is the second script for beginners. This script is based on multiple windows scenario where you face another window, have to verify something and switch back to original one and verify some element again. Actions are defined as per comments. The annotation @Test identifies that a method is a test method. Will execute the method before each test. This method can prepare the test environment (e.g. read input data, initialize the class). Will execute the method after each test. This method can cleanup the test environment (e.g. delete temporary data, restore defaults). Will execute the method once, before the start of all tests. This can be used to perform time intensive activities, for example to connect to a database. Will execute the method once, after all tests have finished. This can be used to perform clean-up activities, for example to disconnect from a database. Fails, if the method does not throw the named exception. Fails, if the method takes longer than 100 milliseconds. Once your project is set up, you can see that WebDriver acts just as any normal library: it is entirely self-contained, and you usually don’t need to remember to start any additional processes or run any installers before using it, as opposed to the proxy server with Selenium-RC. Note: additional steps are required to use Chrome Driver, Opera Driver, Android Driver and iPhone Driver. Selenium-RC allows the test automation developer to use a programming language for maximum flexibility and extensibility in developing test logic. For instance, if the application under test returns a result set, and if the automated test program needs to run tests on each element in the result set, the programming language’s iteration support can be used to iterate through the result set, calling Selenium commands to run tests on each item. Selenium-RC provides an API (Application Programming Interface) and library for each of its supported languages: HTML, Java, C#, Perl, PHP, Python, and Ruby. This ability to use Selenium-RC with a high-level programming language to develop test cases also allows the automated testing to be integrated with a project’s automated build environment. 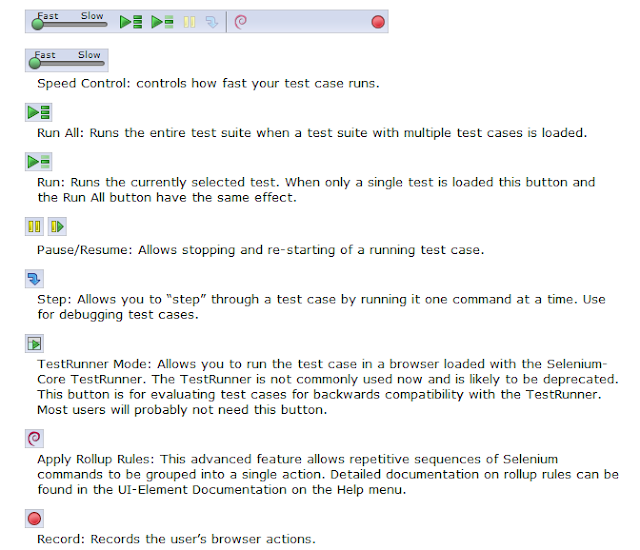 Selenium-IDE is the Integrated Development Environment for building Selenium test cases. It operates as a Firefox add-on and provides an easy-to-use interface for developing and running individual test cases or entire test suites. Selenium-IDE has a recording feature, which will keep account of user actions as they are performed and store them as a reusable script to play back. It also has a context menu (right-click) integrated with the Firefox browser, which allows the user to pick from a list of assertions and verifications for the selected location. 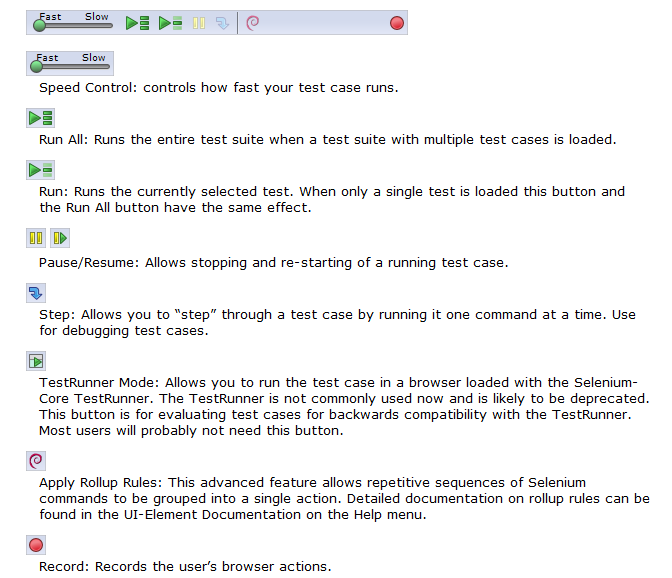 Selenium-IDE also offers full editing of test cases for more precision and control. Although Selenium-IDE is a Firefox only add-on, tests created in it can also be run against other browsers by using Selenium-RC and specifying the name of the test suite on the command line. Accessibility testing is the technique of making sure that your product is accessibility compliant. There could be many reasons why your product needs to be accessibility compliant as stated above. Such as blindness, low or restricted vision, or color blindness. User with visual impairments uses assistive technology software that reads content loud. User with weak vision can also make text larger with browser setting or magnificent setting of operating system. Such as the inability to use a keyboard or mouse, or to make fine movements. Such as reading difficulties, dyslexia or memory loss. Development team can make sure that their product is partially accessibility compliant by code inspection and Unit testing. Test team needs to certify that product is accessibility compliant during the functional testing phase. In most cases, accessibility checklist is used to certify the accessibility compliance. This checklist can have information on what should be tested, how it should be tested and status of product for different access related problems. Template of this checklist is available here. For accessibility testing to succeed, test team should plan a separate cycle for accessibility testing. Management should make sure that test team have information on what to test and all the tools that they need to test accessibility are available to them. Make sure that information is visible when display setting is changed to High Contrast modes. Make sure that screen reading tools can read all the text available and every picture/Image have corresponding alternate text associated with it. Make sure that product defined keyboard actions do not affect accessibility keyboard shortcuts. This category of tools is what a person with disability will use. To make sure that product is accessibility compliant, tools like screen readers, screen magnifiers etc. are used. Testing with an assistive technology has to be performed manually to understand how the AT will interact with the product and documentation. More information on the tools is present in tool section of this website for you to explore.